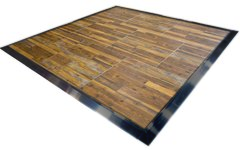 The price includes setup and dismantling of this Barnwood Style dance floor. Subflooring must be added if setup will be on grass, dirt, or other uneven surfaces. Image not to actual scale or size.